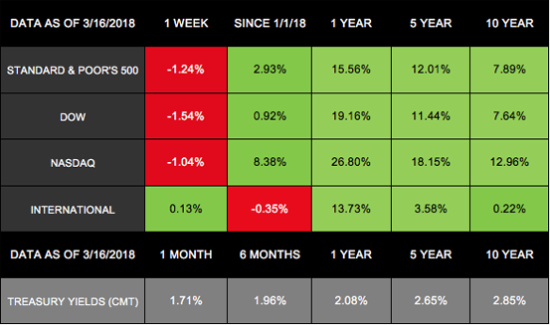 Markets were up on Friday, but domestic stock market indexes lost ground for the week as political turmoil and potential trade wars weighed on investors’ minds. The S&P 500 dropped 1.24%, the Dow gave back 1.54%, and the NASDAQ decreased 1.04%. International stocks in the MSCI EAFE barely avoided losses with a 0.13% gain. For 85 years, Bear Stearns was a respected institution that became one of the world’s largest investment banks. When the housing market crashed in 2007, the firm realized it had taken on far more risk than planned. As a result, the firm ran out of cash, and on March 16, 2008, JPMorgan bought the previously valuable company for only $2 a share. In retrospect, Bear Stearns’ collapse was the first real glimpse of the pending Great Recession. Less than a year later, markets hit bottom on March 9, 2009. In the years since, stocks have corrected multiple times, losing over 10%. But, they have never lost 20% to push into a bear market – meaning we’re in the midst of the 2nd-longest bull market since World War II. Time can make some memories fade, but we doubt that anyone who experienced the Great Recession forgets how challenging and scary it felt. 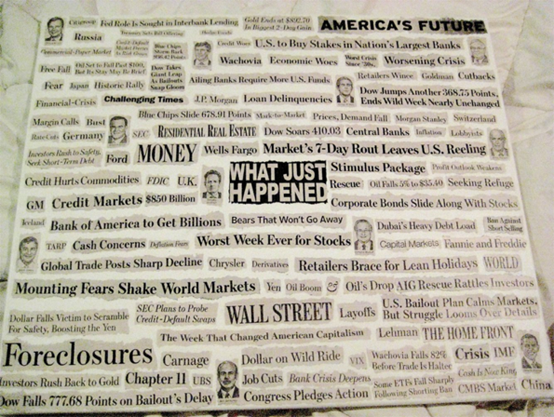 Here’s what headlines were telling us: Source: http://www.businessinsider.com/what-the-headlines-looked-like-at-the-height-of-the-2008-financial-crisis-2017-3 Despite the market losses and economic turmoil, the Great Recession was also a powerful reminder of Warren Buffett’s advice: “Be fearful when others are greedy and greedy when others are fearful.” While the markets seemed to be in a free-fall, allowing emotion to dictate investing choices was easy. But anyone who escaped the markets’ bottom missed an incredible growth opportunity. Nine years after the S&P 500 hit its low, the index was up 390% – and was 122% higher than its record close before the Great Recession began. So, while the collapse was painful, stocks weathered the storm, sailing far beyond where they were before. The economy is also in a very different place than it was a decade ago. Personal Exemptions. Taxpayers can claim 1 exemption on joint returns for themselves and 1 for their spouse. Married taxpayers who file separate returns can claim their spouse as an exemption if their spouse had no gross income, is not filing a return, and is not listed as a dependent for another taxpayer. Dependent Exemptions. Dependents are children or relatives who meet certain conditions. (Visit www.irs.gov/help/ita/whom-may-i-claim-as-a-dependent for more information about dependency requirements.) Filers must list their dependents’ Social Security numbers. Dependents’ Exemptions. Dependents of other taxpayers cannot list themselves as personal exemptions on their own returns. Dependents’ Requirements for Filing. Dependents may have to file returns if they generated income and owe taxes. Exemption Phase-out. Taxpayers who earn above certain income levels will lose all or part of the $4,050 personal exemption. The amounts vary depending on the filers’ status. Other details may apply, and you can find more information on the IRS website. What Do the Pros Do Before Going to the Course?